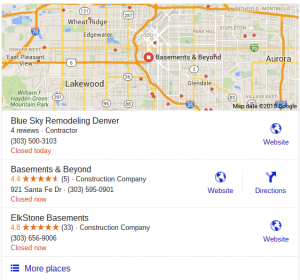 Since 2003, we’ve worked with hundreds of Denver and national businesses on Local SEO, national SEO, and web visibility. Our programs are as unique as your business. Many SEO companies have a pretty standard system. It doesn’t take a lot of thought process to figure out that if you do what everyone else does, you’ll end up in the middle of the pack. Local SEO is actually the combination of three different visibility strategies, we then add a fourth we simply call the local authority. Three areas you want your site to be visible for the important searches people use to find your service/product. 2.) Organic Results. Those are the normal results you see after the sponsored ads from Google and the map results when the term serves up a maps listing. Because of recent changes, there are fewer “map” results displayed for some local business, making the organic results and pay per click advertising a higher priority. Our long-term clients sell over Two million dollars a year based on organic results and other web visibility systems. 3.) Other websites that have great visibility and traffic, that can lead new customers to your site. All of this is based on a well-designed website, that communicates to the search engines the right information in the correct way. This is called on Site SEO. We add a completely unique element to the mix with our local authority programs which add great new content, video, and value to your site. By standing out with great and targeted content to your audience, you’ll see better site engagement and better conversions. How much will this investment be? Depends on many factors, but you can generally budget from $500 to $950. a month for the full program which includes video interviews and content added to your site. Or contact us for a free video review of our current rankings and Local Seo status. Or just click on the SEO category on the right side of the page.